Noah Genatossio is a recent graduate of the University of Washington in Seattle with a B.A. in political science and a minor in history. Noah lives in Seattle and works in the field of tax law & white collar criminal defense as a legal assistant. 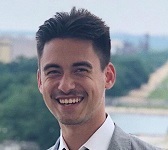 While a student at the University of Washington, Noah interned with Congresswoman Cathy McMorris Rodgers in Washington D.C., the American Israel Public Affairs Committee (AIPAC) and worked on the Bill Bryant for Governor Campaign in Washington State. Noah began writing for Black Past as an undergraduate student and continues to write for Black Past with a focus on African American conservatives.